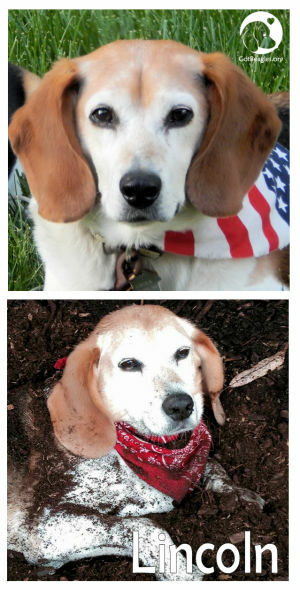 Lincoln was a gentle giant within our Beagle family (which includes BREW Ambassador Scoobie, our little lady Ida and our one-eyed pirate Phineas). He never once growled, bared his teeth in anger or displayed any signs of aggression. His loving nature was evident that very first time we laid eyes on him when he sat directly in front of Carol and began kissing her face when she knelt to pet him. Shortly after we adopted Lincoln a mast cell tumor was found, and successfully removed. He seemed no worse the wear, living each day to its fullest (wrestling with brother Phin, eating breakfast, wrestling with brother Phin, sleeping, walking the bike trail before dinner and wrestling with brother Phin before bedtime), his tail in constant motion and with a silly grin on his face the whole time. In November 2015 another tumor was found in the same location and once again it was successfully removed. As they say in baseball, "Three strikes and you're out". In August, after our family had moved from Illinois to New Mexico, we noticed a small pea sized bump in the exact same spot.Then, virtually out of nowhere, it grew to "golf ball" sized and a quick trip to the veterinarian confirmed that surgery was indeed required and promptly scheduled for the following week. Medication was administered in the hopes of shrinking the mass but within two days it had grown to the size of a fist, hardened and begun to ooze blood. Surgery, unfortunately, was no longer an option. On Tuesday September 13, 2016 our “son”crossed the Rainbow Bridge. It was much quieter when we returned home and opened the garage door. One of the beautiful voices was missing from the choir.